The aim of postmodern ERP is to connect numerous aspects of your business on one system to enable faster, better decision-making. You can go one step further by using artificial intelligence (AI) technologies to analyze and react to your enterprise data without the need for human intervention. 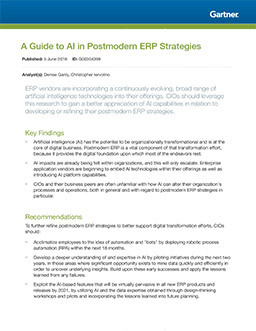 How can AI fit into your ERP strategy? Which specific use cases can give you the greatest return on your investment? Find out in a research note by Gartner. The most common applications of AI technology in business. How conversational AI platforms can improve the effectiveness of your workforce. Where the Internet of Things (IoT) may fit into your ERP strategy. How AI enhances the HCM, finance, and procurement functions. Gartner’s four recommendations for supporting your digital transformation. This research note will give you a thorough understanding of AI in just minutes. Download it now. This research note is offered by Acumatica, a leading provider of cloud business management software that gives mid-sized companies a complete, real-time view of their businesses—anytime, anywhere. Acumatica continues to grow rapidly by providing a strong solution to the expanding small and medium ERP software market. However, Acumatica is not resting solely on this market segment. The company continues to build out more functionality to support larger, more complex businesses, as evidenced by Acumatica's 2018 R1 and 2018 R2 releases.